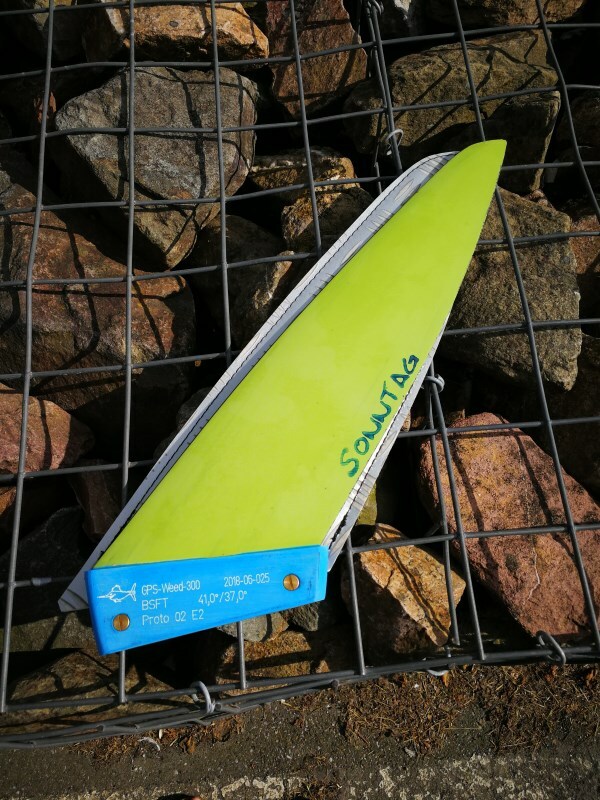 The GPS-Weed is designed as high performance speed fin that can be used at spots having too much weed not allowing to sail an upright speed fin like the GPS_6. The sizes of the GPS-Weed are adjusted to sail stable and fast with small speed boards (42cm) up to medium slalom boards (72cm). The fin has a progressive leading edge curve causing shed-off forces that gets higher as more the weed moves downwards in tip direction. We can adjust the rake as requested, but we found very good performance with 41° rake close to the base. At this (base) rake the fin has around 45° rake in middle and 48° 20mm from the tip related to a 300mm (vertical) length. We use a profile that is based on the very well approved GPS_6 design also showing in this new model excellent performance. The fin creates sufficient vertical lift by just very low amount of geometric twist. The board’s nose position is in a medium position giving good control and not causing a sticky feeling when sailing on very flat water. The fin induces a nice center-point feeling during the speed run and never shown tendencies to stall or to spin-out. The GPS-Weed can be produced in sizes of 17 to 30cm with Tuttle base.